Price analysis suggests that the price of corn silage depends on corn silage quantities, the price of alfalfa hay, the price received by farmers for milk, and the price of corn grain. Estimated corn silage price is sensitive to alfalfa hay price and corn grain price. Price estimates combined with understanding of relevant supply and demand factors from an individual farm business owner's perspective can aid decision making regarding corn silage price. Given most recently available alfalfa hay and corn grain prices (August, and September/October 2013, respectively), price analysis suggests an estimated corn silage price of about $42 per ton. A farm business owner can examine how much he/she would be willing to supply to a market at a given price. Cost of production analysis combined with consideration of other factors helps to define the supply relationship. A seller can develop a target based upon the above, but actual market conditions provide no guarantee that a buyer will purchase quantities desired at a price that achieves the producer's cost target. Some farm business owners might approach the problem of determining corn silage price from a value in production, or input demand perspective. The amounts of corn grain and corn stover in a ton of corn silage, relevant prices, and corn silage's place in the milk production process are key variables. A buyer can develop a price target based upon the above, but actual market conditions provide no guarantee that a producer will sell the quantity desired at a price that matches the buyer's willingness to pay. For more information regarding the two approaches mentioned above, visit the team’s website at and click on the “Forages” tab. Although factors in price determination, the two approaches described above, by themselves, in isolation don’t completely determine market price and quantity. Supply and demand relationships work simultaneously in markets to determine price and quantity. Empirical price analysis brings supply and demand relationships together to determine price. Empirical price analysis suggests that corn silage price is a function of corn silage quantities, alfalfa hay price, the price received by farmers for milk sold, and corn grain price. Ordinary least squares regression provided an estimate of corn silage price as a linear function of the above variables. 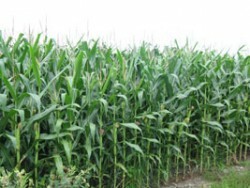 Even though the analysis is somewhat rough, elementary, readers of the original article describing this work in August 2012 noted that the analysis and estimates generated should be helpful to farm business owners looking to price corn silage. Corn silage price estimates can be generated using the ordinary least squares regression results reported in August 2012, where estimated corn silage price is a function of alfalfa hay price and corn price, other factors (corn silage quantity and milk price) fixed at average levels for the period 1991 through 2010.
estimated corn silage price ($/ton) = 10.621 + (0.079 x price of alfalfa hay ($/ton)) + (2.448 x price of corn ($/bushel). Consider the following as current market conditions. Using the estimating equation and the above prices for alfalfa hay and corn grain yields an estimated corn silage price of $42 per ton. Estimated corn silage price is sensitive to alfalfa and corn grain prices. Earlier this year, producers described market conditions very different than those described above. Suppose alfalfa hay price is $300 per ton, and the price of corn grain is $7.25 per bushel. Then, estimated corn silage price is $52 per ton. Corn silage price estimates combined with understanding of relevant supply and demand factors from the individual farm business owner’s perspective can aid decision making regarding corn silage price. For more information please contact John Hanchar. Thanks to Christian Yunker, CY Farms, LLC/Batavia Turf, for providing valuable comments on earlier versions of this work.